As it’s the school holidays, and to tie in the Kitchen Summer Activity series that we’re running on the blog we’re going to focus this month’s Foodie Blog on the children. We’ve got recipes you can do with the kids, seasonal ingredients that they will eat and news of food related events happening over the summer that will keep the little (and slightly bigger) ones entertained. Season’s Eatings – what foods are in season for August? We’ve picked out ingredients that are in season and that we think most children will enjoy both eating and cooking. 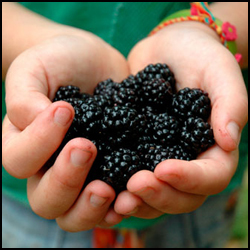 Blackberries, blueberries, apples and sweetcorn are all readily available in August, and not only from the shops! Often one of the few vegetables that children will eat because of its sweet flavour, sweetcorn can be part of the main event as well as a side vegetable. Sweetcorn fritters are really easy to make and this recipe combines them with a mango salsa for extra sweetness that kids will love. This sweetcorn and tomato muffin recipe combines sweet and savoury and is great for taking out on a picnic. Finally, how about making the most of the sweetness of sweetcorn with this sweetcorn pudding recipe which is intended to be eaten as a dessert! Blueberries, blackberries and apples are all in season at the moment and if you look in the right places you can even go foraging for them in the hedgerows and on the trees (we are not advocating taking fruit from private gardens!). There are plenty of blackberries in particular growing wild that you can pick. Here’s a guide from wild food experts Incredible Edibles on foraging for food. The following are lovely recipes that you can make with these summer fruits that we think the kids will approve of (some are even quite healthy but don’t tell them that!). Chocolate and blueberry brownies, blackberry jelly fool, apple and blackberry crumble cake, quick blueberry, lemon and crème fraiche cheesecake, blackcurrant bircher muesli and here’s a range of blackberry recipes for children from Nature Detectives. Wakefield’s Food, Art & Crafts Market returns on 9th August. There will be the usual food stalls as well as fairground rides and entertainment for the children. In other news, we are very excited that the Great British Bake Off is returning to our screens on 6th August. This one’s not strictly child related however this year sees the youngest ever baker taking part. Aged just 17, Martha is still at school so she could hopefully inspire lots of young people to get into or develop their baking and cooking skills – watch this space! We’re running a series of blogs over the summer with ideas for keeping the kids entertained over the holidays with activities you can do right from your own kitchen. Ranging from the obvious cooking and baking through to scientific experiments and creative play, we hope you’ll find some inspiration in there for fun, inexpensive things to do from home. You can see all the posts so far here (there will be one each week of the 6 weeks holidays) and we also have an accompanying Pinterest board. You can also join in the conversation by telling us about any of the suggestions you’ve tried yourself or coming up with some of your own. We’re adding everyone who comments on any of our summer activity Facebook posts entry into our prize draw to win a £25 Toys R Us voucher so come and talk to us! 0 Responses to "The 3Style Foodie Blog – August"